Offering full coverage and lots of movement without the weight of longer styles, our medium length wigs are ideal for everyday wear. Hitting just at the shoulders, our versatile medium length wigs come in dozens of colors, cuts, and textures. Shop shoulder length wigs from top designers including Raquel Welch, Noriko, Rene of Paris, and Jon Renau. Not too long, not too short…if you feel a little bit like Goldilocks when you’re searching for a wig, then a shoulder length style might be just right! Our medium length wigs offer the perfect balance of worry-free coverage, lightweight comfort, and carefree styling possibilities. 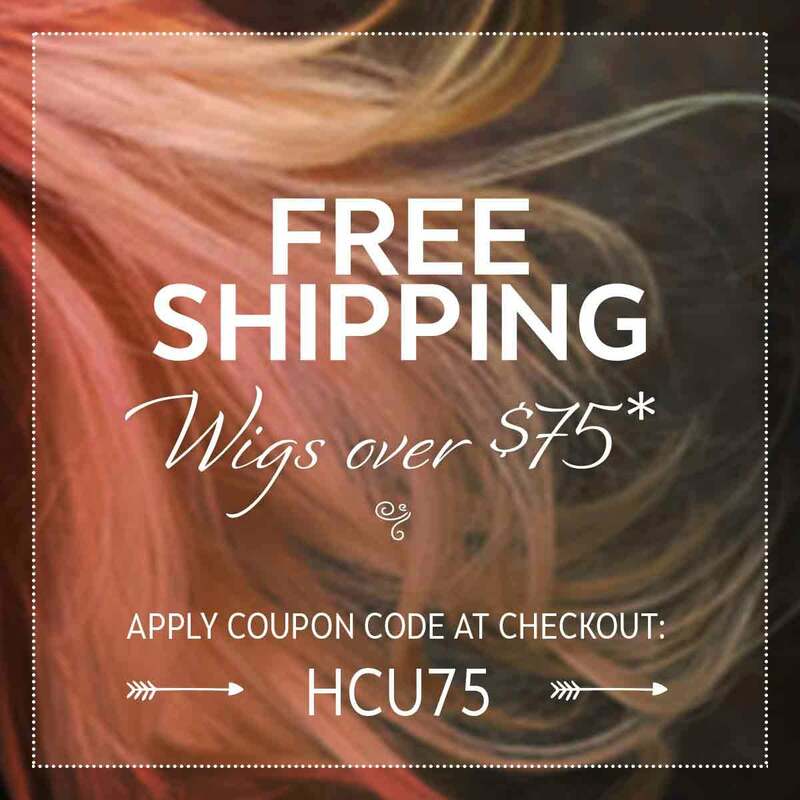 At Headcovers, we’ve selected both natural hair and synthetic shoulder length wigs in a wide variety of cuts, colors, and cap options, so you’ll be certain to find a look you love. The wig experts at Headcovers have been proud to serve cancer patients for more than 20 years, so we know how important a wig can be when you’re undergoing cancer treatment. If you’ve experienced hair loss due to chemotherapy, the right wig can help you get back to the look you love—and feel like yourself again. With our wide selection of shoulder length wigs, you’ll be able to choose a style that mimics the appearance of your natural hair, or experiment with something completely new! If you’re not sure where to begin, our compassionate style experts are always available to help you find a color and cut you’ll look forward to wearing every day. Why Choose a Shoulder Length Wig? Choosing a wig is a big decision. Do you want a look that’s long and dramatic? Something short and flirty that fits into your routine with ease? A shoulder length wig can offer the best of both worlds, providing a breezy, natural-looking style with exceptional versatility. Medium length wigs allow for more coverage than shorter styles, but aren’t as heavy as longer options. Whether you’re looking for fashion-forward bangs, lots of layers, voluminous curls, or dimensional highlights, you’ll be able to find a shoulder length wig that you can wear with confidence. Which Medium Length Wig Is the Most Flattering? Shoulder length haircuts are undoubtedly among the most popular styles for women—and for good reason! Medium length cuts are adaptable and flattering for almost everyone; start with your face shape to find the specific look that’s best for you. Shoulder length styles are great for square faces, especially when they include waves or wispy layers to soften any harsh angles. Medium length hair is also perfect for balancing the narrow chin of a heart-shaped face. For those with oval or diamond face shapes, almost any style is flattering—so feel free to experiment with new shoulder length looks when choosing a wig! For more tips on finding the right option for your face shape, check out our hairstyle guide here. A great wig can be a big investment, and it’s sure to become an essential part of your daily routine. That means you’ll want the wig you love to last as long as possible. In general, the lifespan of a wig is around six months with regular wear; following the proper care guidelines will ensure that your wig makes it to that milestone while looking fantastic. Wig care differs based on whether you choose synthetic or natural hair. Synthetic wigs should be gently washed using specially designed products every 6 to 8 wears. Human hair wigs are even more delicate; we’ve gathered our best washing tips for human hair here. To extend the life of your wig, you can also choose to wear it with a wig cap, which limits exposure to the natural oils of the scalp. Whether you choose natural or synthetic hair, resist the temptation to dye your wig if you want to change up your look; colorants can cause irreparable damage. Nearly every wig designer offers a variety of shoulder length options, but some brands stand “head and shoulders” above the rest when it comes to quality and style. For a timeless look, browse our collection of Raquel Welch wigs. Look to Noriko and Jon Renau for of-the-moment styles that capture the latest hair trends. Ready to find your perfect wig, or still want to learn more about choosing the wig that’s right for you? Our expert customer care team is here to help! Call us with questions or concerns at 1-800-264-4287 (HATS).